Often used in conjunction with Infusionsoft, AppointmentCore allows you to automate your appointment bookings and sync them with your Google or Outlook calendar, your GoToMeeting account, and the client's Infusionsoft record. Smith.ai's receptionists can book appointments on behalf of your prospects and clients who we speak with, using your custom booking links, and all appointments will appear in real-time on your calendar or the calendar of another person on your team whose availability matched the caller's. 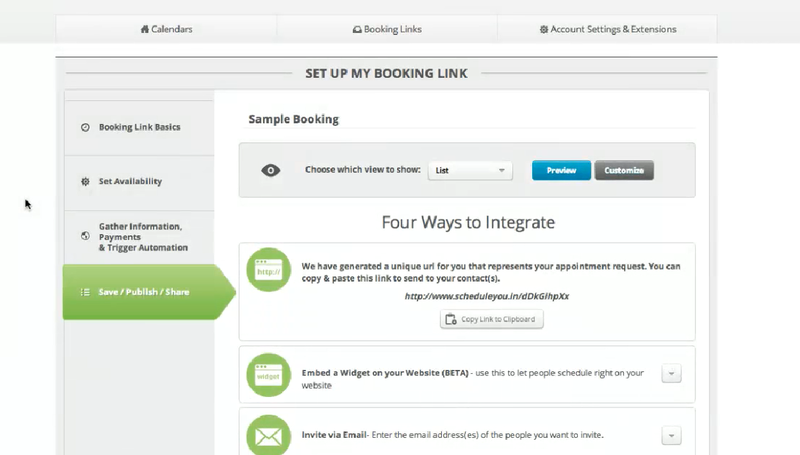 Click on the booking link you want Smith.ai's receptionists to use to book appointments. Paste that URL into an email to support@smith.ai with the subject line "AppointmentCore integration request." Be sure to include any instructions for our receptionists to properly book appointments using this link. Repeat steps 3 through 6 for all other booking links you want your receptionists to use, and then send the email. Please send all links and the instructions for each link in one email, not multiple. That's it! Well notify you as soon as the integration is complete. We're typically able to start booking appointments within one business day. Not sure how to best make use of this integration? We can help you think through how to use our receptionists to book appointments for your prospective and existing clients. Contact Smith.ai Support by phone at (650) 727-6484 or by email at support@smith.ai Monday through Friday, 5am – 6pm PT. Need help finding and customizing your booking links? Check out this helpful set of articles from AppointmentCore.